In 2009, the excellent documentary ‘Oil City Confidential’ quite rightly renewed interest in Dr Feelgood and helped to re-establish their position as one of the great British rock’n’roll bands of the mid-Seventies. However, the film failed to acknowledge one big part of the story, in that, during the short period immediately prior to the emergence of Punk Rock, the Southend and Canvey Island area was a real scene of musical activity, with a whole slew of bands and musicians appearing with the intent to take rock’n’roll back to its’ raw, high energy roots. 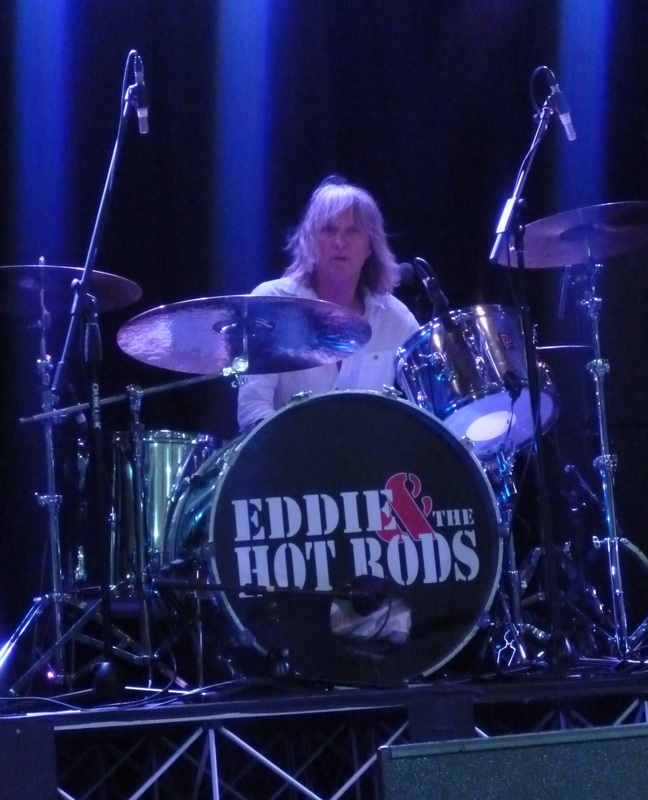 Alongside Dr Feelgood, the most important were undoubtedly Eddie & The Hot Rods. Taking their cue as much from the likes of the MC5 and New York Dolls as the Stones and The Who, they possibly paved the way for Punk even more so than the Feelgoods, and certainly found themselves more directly involved when the new bands began to make their own presence felt. In retrospect, their role has often been downplayed and the phrase ‘they were never really a punk band’ has often been used to dismiss them, but firstly, they never claimed to be, and secondly, however you want to play it, ‘Do Anything You Wanna Do’ remains one of the classic singles of the Punk era. Forget the categories, just listen to the music ! Between 1976 and ‘79, the band (Barrie Masters, Dave Higgs, Paul Gray and Steve Nichol, later to be joined by Graeme Douglas) released three great albums and toured extensively in the UK, Europe and America. However, by 1980, the relentless schedule began to take its’ toll and both Paul Gray and Graeme Douglas left the band (the former to join The Damned.) One final album from the depleted line-up, ‘Fish’n’Chips’, was released by EMI, but their total lack of promotion led to poor sales and the band subsequently split. The Hot Rods briefly reformed in the mid-Eighties, albeit with only Masters and Nichol from the classic line-up, but it wouldn’t be until 1992 that the original members came back together to play live again and record the album ‘Gasoline Days’. Various personnel changes followed until only Masters remained, but since 2001 he’s maintained a solid band featuring Simon Bowley, Richard Holgarth, Ian Dean and Chris Taylor. They’ve toured consistently and established themselves as a second ‘classic’ line-up, delivering sets that highlight their own material and proudly celebrate the bands’ legacy. In 2014, following the sad loss of Dave Higgs, the remaining original members came together to play a Tribute gig for their former bandmate, appropriately at the legendary Oyster Fleet on Canvey Island. 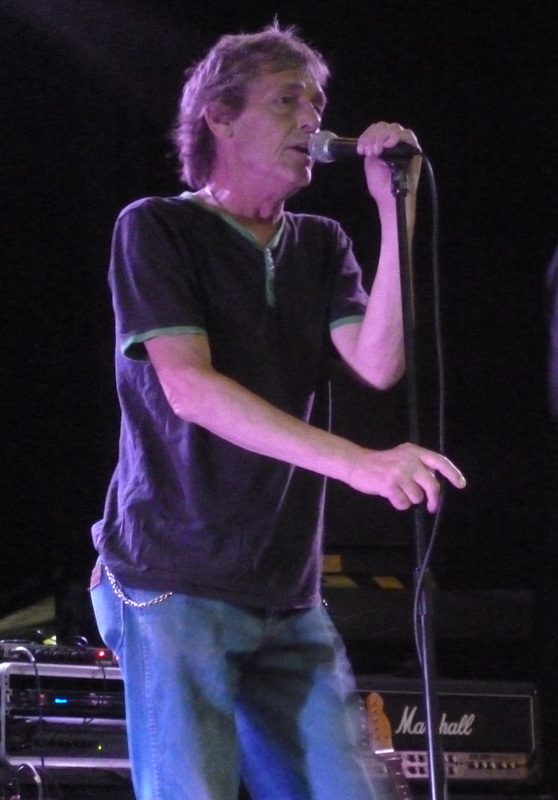 In a two-part gig, Barrie Masters first fronted the current line-up as they blasted through a set of mostly more recent material, before returning to the stage with Paul, Steve, Graeme and current guitarist Richard Holgarth. It was a great set and a perfect to remember their old friend, but at the time, there were no intentions for further reunions. But the fact was, everyone, band and audience, enjoyed it so much that it really had to happen again and so, a year later, they reassembled for two more gigs, this time in Harlow and London. I’d been intending to interview Barrie Masters for some time, and this seemed like the ideal occasion. I loosely arranged to meet him at the soundcheck and, after a lot of hanging around (part of the job-description) we eventually find some comfy chairs backstage and start in on the interview. When you read books that talk about that era, it’s often made out that the ‘Pub Rock’ scene was a deliberate attempt to bring the excitement of rock’n’roll back down to a street level. Do you think that kind of agenda really existed, or was it more like a bunch of like-minded people just being drawn together because they enjoyed the music ? Your second album, ‘Life On The Line’, seemed to be a step away from the more R’n’B influences of the first and is certainly a lot more ambitious. Was that a deliberate move or just the way you were developing as a band ? Funnily enough, when that single came out, your name was shortened on the record sleeve and label to ‘The Rods’. I’m pretty sure that was the only time that happened. Was there any reason behind it ? The sleeve also featured an image of Aleister Crowley wearing Mickey Mouse ears, while there was one of his quotes included on the back of it. Was there any particular reason for that ? It was also around this time that the first cracks started to appear in the band. Do you think that was just because you’d all been working so hard together for several years ? There were a couple of good singles from that album, but EMI didn’t even bother to release them in picture sleeves ! That gig had originally been intended to be just a one off reunion, especially as the current line-up has been keeping such a busy schedule. So what made you decide to do these further reunion shows now? Do you think it’s something that you might do again, after these dates ? So you’ll be straight back to work with the current line-up after these gigs ? 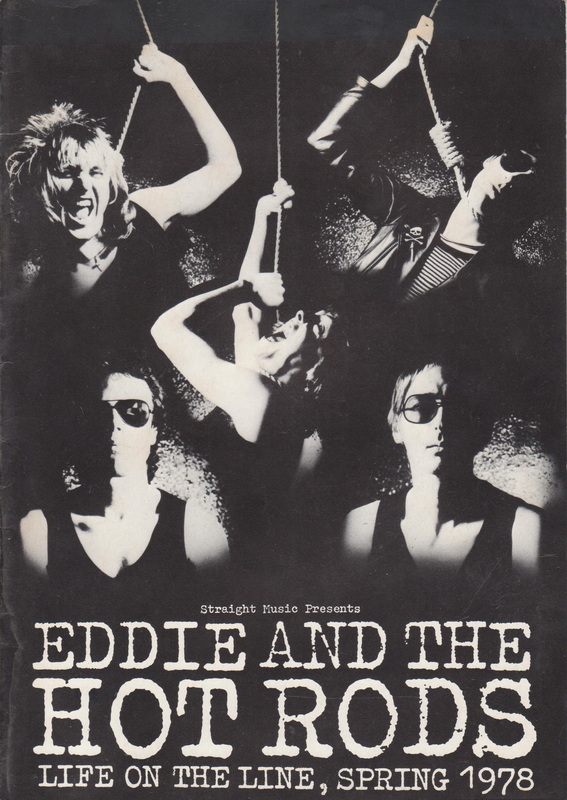 Okay, final question, to try and solve a mystery… When the band first used to play live, you used to have a mannequin-dummy onstage, who you would tell people was ‘Eddie’… where did he go after he was kicked-out of the band ? Time to let Barrie get himself ready for the gig, so I wonder back out into the venue, meet some friends and watch the support band, Headline Maniac. As already mentioned, they’re a three-piece band featuring Ian, Simon and Chris from the current Hot Rods. They play a harder, more blues-rock style than the Hot Rods, but instil it with plenty of power and never lack a good hook. It’s a good start to the evening and certainly gets the audience ready for the Hot Rods. The place is pretty full by the time they hit the stage, and from the outset, they’re obviously enjoying themselves and playing at their best. These guys just belong onstage together and it’s a treat to see them. The energy bounces back and forth between the stage and the audience, with plenty of great songs to keep everyone on their toes. ‘Power & The Glory’, ‘Teenage Depression’, ‘Ignore Them’, ‘Life On The Line’ and, of course, ‘Do Anything You Wanna Do’. They may be older, but the energy-levels really hadn’t dropped at all, as they put everything into the performance and delivered a set that we’re all going to remember. The encore is just one song, but when it’s an excellent version of ‘The Beginning Of The End’, I doubt if anyone was disappointed. As discussed in the interview, it’s uncertain if this line-up will be playing again, but the current band are also well-worth catching in their own right, so don’t be shy. Maybe they weren’t a ‘punk band’ – does that even matter ? 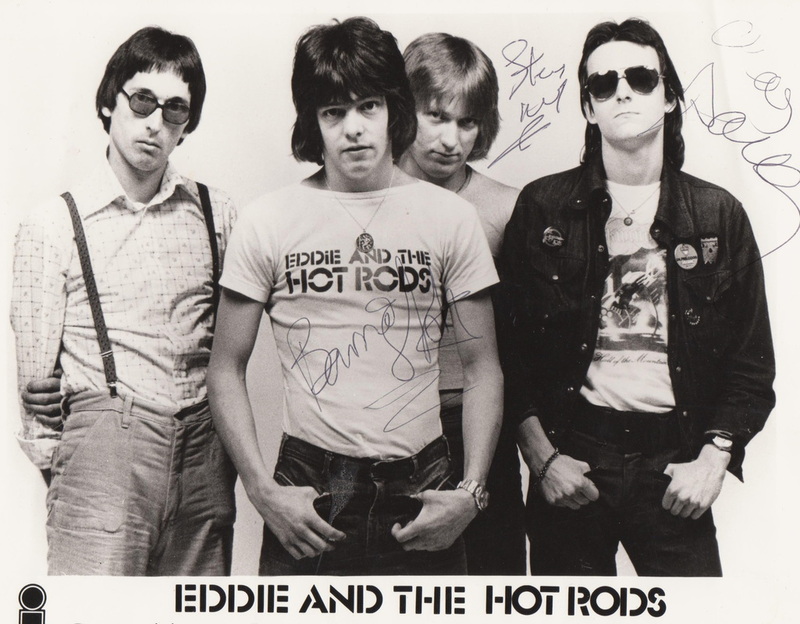 At the end of the day, Eddie & The Hot Rods were, and continue to be, a great band. And that’s all you need to know.